Subject: The establishment of Boone’s Ferry, Boone’s Landing (the precurser to the City of Wilsonville) and Boone’s Ferry Road. Many of Oregon’s early transportation routes resulted from the efforts of enterprising pioneers like the Boone family of Clackamas County. 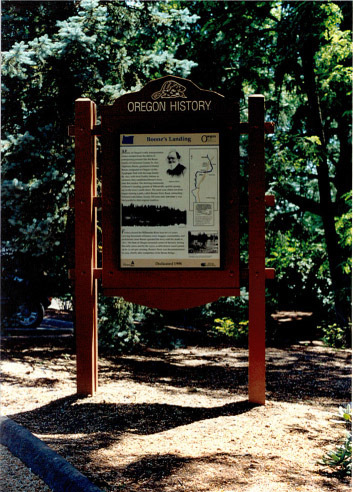 In 1846 Alphonso Boone, grandson of Daniel Boone, emigrated to Oregon via the Applegate Trail with his large family. 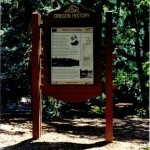 By 1847, using local Tuality Indians as oarsmen, they established Boone’s Ferry near this marker. The thriving community of Boone’s Landing, genesis of Wilsonville, quickly sprang up on the river’s north shore. The same year, eldest son Jesse began clearing a path, called Boones Ferry Road, connecting Portland with Salem. Nearly 100 years later Interstate 5 was laid parallel to the original roadway. Ferries crossed the Willamette River here for 107 years carrying thousands of horses, cows, buggies, automobiles, and pedestrians. Jesse Boone operated the ferry until his death in 1872. The State of Oregon assumed control of the ferry during the early 1900’s, and by the 1950’s, a cable-drawn vessel carried up to 12 cars per crossing. Boone’s Ferry was decommissioned in 1954, shortly after completion of the Boone Bridge.